When the time came to start decorating our surf theme baby nursery, my husband said that he wanted be involved and as things turned out; he got to make all the decorative decisions. He made all of the choices that you see in the pictures from the crib set to the colors for the cool painting technique that he used to paint the nursery wall. Since we knew that we were having a baby boy and that his daddy loves to surf; a surfing theme was the natural way to go. One of the first steps we made in decorating our surf theme was to paint the wall beside the crib with a bright, modern plaid design. The paint colors that we used are ocean blue, lime green and white with red and ocean blue accents. The surfboard behind the crib is the actual board that his daddy uses to surf the waves at our favorite beach. I made the hand-painted beach theme nursery artwork hanging above his crib titled "WELCOME" with the waves welcoming visitors to the baby's room. Also, there is a bright and colorful surfboard awning window treatment that was cut out from aluminum. The results are a surf themed nursery that is so much fun and our son seems to love all of the bright colors! Surfing makes a great baby nursery theme and I plan to use my long board as part of our nursery decor. I like the shade of blue that you used on the walls but I'm not sure about the plaid painting technique. Great job, though! I give this room a 10! The lime green and blue paint colors are perfect for the theme. Join in and write your own page! It's easy to do. How? 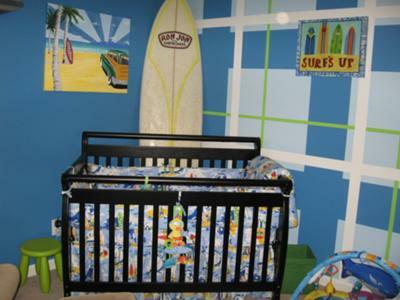 Simply click here to return to SURF THEME NURSERY PICTURES and DECORATING IDEAS.